At the beginning of last season, we looked at the 15 potentially most important players for Chelsea in their ultimately disappointing 2017-18 title defence. With a brand new campaign under way and the summer transfer window shut, some have departed or slipped, while others have grown in importance. Here’s new head coach Maurizio Sarri’s revised list of crucial performers. This list is not extensive and has been ranked according to varying factors. Some players still with a part to play, like Mateo Kovacic, have been omitted. Performance, potential, the ability to make an impact and influence the course of a game, other options in that area of the field, the ability or inability to replace them and market value have all played a part in revising the 15. A surprise choice perhaps, but no player is more important to the success or failure of Sarri’s style at Chelsea. Jorginho sets the tone and tempo from the base of midfield with short, sharp passes as well as organising the high press. A month into his Blues career, he is already running this team. Preseason underlined that Sarri’s midfield is fatally vulnerable without Kante’s dynamism and peerless defensive instincts; how he adapts to a more expansive role in the new system is a key question for Chelsea’s season. Judging by his goal against Huddersfield Town, the early signs are positive. The best business of Chelsea’s summer was keeping their star Belgian at Stamford Bridge. He remains their most talented attacking player as well as their most reliable match-winner and, once he is back up to speed, there’s every reason to think he will be devastating in Sarri’s system. A lack of goals doomed Chelsea’s hopes of a Premier League top-four finish last season and Morata remains vital to their chances of Champions League qualification this time around. He has all the physical and technical qualities to shoulder the burden, but is he mentally strong enough? Given his limitations with the ball at his feet, letting Thibaut Courtois leave might not have been the worst decision for Chelsea. How it is viewed in time will depend largely on whether or not Kepa proves the kind of progressive, modern goalkeeper Sarri wants, in addition to being sound in terms of the fundamentals. Chelsea’s captain on the pitch last season and a leader in the dressing room, shifting to right-back has arguably made Azpilicueta more important. Davide Zappacosta is nowhere near as reliable defensively, while Victor Moses is not even viewed as a full-back option by Sarri. What a difference a month makes. Antonio Conte’s departure and Sarri’s arrival has brought Luiz back out of the cold and into the heart of Chelsea’s new back four, where his personality and skill level on the ball are highly valued. He needs to show the old mental lapses are behind him to maintain this position, though. Sarri’s insistence on a high defensive line means the recovery speed of Rudiger, arguably Chelsea’s only good signing in the summer of 2017, will be even more important. He is also polished enough on the ball that he could keep his starting spot even if Andreas Christensen forces his way back into the XI. Chelsea’s best attacking performer in the second half of last season, Willian has already made it abundantly clear he is much happier under Sarri than Conte. He will need to maintain that high standard on the pitch if he is to keep his place ahead of Pedro once Hazard regains full fitness. Chelsea boss Maurizio Sarri doesn’t want to turn his new side into Napoli 2.0. The shift to full-back has minimised what Alonso does best and highlighted his limitations. He is not a good one-on-one defender, positionally suspect and not athletic enough to stick with the fastest, trickiest wingers. He is, however, great on the ball and remains a huge threat from set-pieces, either as taker or in the air. Drawing conclusions from the opening weeks is a dangerous game, but Pedro looks like he will enjoy himself under Sarri. Still the best natural finisher in the Chelsea squad, he will get plenty of opportunities to drift infield and trouble opposing goalkeepers, either from the start or off the bench. Exactly the type of “point of reference” Conte wanted, it remains to be seen whether Giroud is mobile enough to play a big role under Sarri. He will always be useful though, particularly in combining with midfield runners, and expect him to once again provide solid insurance if Morata fails to fire. 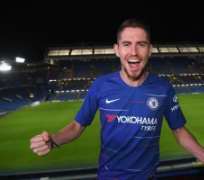 Jorginho’s arrival looks to have cemented Fabregas has an impact substitute — the role he performed so well on Chelsea’s run to the title in 2016-17. Sarri loves the Spaniard’s intelligence and technical ability, but there’s no way a modern midfield can retain balance with him as a regular starter. The next few weeks could well define Barkley’s career at Chelsea. He has the chance to nail down the third starting spot in Sarri’s midfield before Kovacic returns to peak condition and needs to find ways to be decisive. His neat flick to Alonso to win Saturday’s penalty against Huddersfield was a nice start. Having chosen to stay and fight for a first-team place at Stamford Bridge rather than depart for another Premier League loan, Loftus-Cheek is another man out to impress Sarri. The good news for him is that no other midfielder offers Chelsea’s new head coach a similar blend of power and technique.